Why Marx Was Right. Terry Eagleton. A Review. Why Marx Was Right. Terry Eagleton. Yale 2011. “On n’aime point à louer, on ne loue jamais sans intérêt.” (Nobody likes to praise, we only praise out of self-interest). Terry Eagleton considers that the “most familiar objections to Marx’s work are mistaken”. He draws up ten, clusters of criticisms and rejections of Marx, to consider. Eagleton concludes, that Marx “was right enough of the time”. That there is enough rightness there to “make calling oneself a Marxist a reasonable self-description.” He aims not only to show why, the reasons he can make these claims, but in what Marx was correct. Why Marx is Right begins by asserting that what “helped to discredit Marxism” was “a creeping sense of political impotence.” Left disillusionment after the Fall of Communism fed off the “conviction that the future would now be simply more of the present.” (Page 6) It was “thrust to the margins because the social order it confronted” “waxed more ruthless and extreme than it had been before.” (Pages 6 – 7) The confident left of the 1970s was equally discouraged by the exhaustion of “revolutionary nationalism”, more normally called anti-colonialism and anti-imperialism. But the “gloom” on the left, in the era of Thatcher and Regan, followed the failures of the decade. The terrorist adventurism of the German ultra-left, the downward spiral of 1970s Italian ‘armed struggle’, could only have helped underline the radical left’s powerlessness. The left, above all in Europe, lost its position as a serious political player. Its mass influence ebbed away, first with the stemming of the Portuguese Revolution (1974-5), amd (for Western European Communism) the end of the French Common Programme (September 1977). Tthe longer drawn out marginalisation of the ‘Bennite’ left in the UK concluded the process. Mitterrand’s first government in 1981 was unable, or unwilling, to institute democratic socialism. It was this experience which led some former leftists to declare themselves “liberal-libertarians” and shout, “Vive la Crise!” to celebrate the market. The left was at an impasse, well before free-market politicians came to office, the markets were liberalised, anti-colonial revolutions degenerated into tyrannies or kleptocracies, or the Berlin Wall came down. One would consider that it was not only the strength of the social order that contributed to these defeats. A major cause, was, and remains, a crisis of political Marxism that was unable to offer a way out of these difficulties. Some might feel that this picture is close to the sublime, evoking ideas of terror, or greatness beyond our immediate grasp, and dramatic Romantic landscapes run through with light and shadows. Marx would amongst the Dionysians, with an Apollonian gift of Reason. Indeed Eagleton evokes the kind of imagery that one would call “exalted” and for which Marx had a “heartfelt distrust”. The root of tragedy is deep. Eagleton affirms that Marx transcended the “typical Enlightenment” belief in inevitable Progress towards this universal bounty by recognising “violence, disruption, conflict and discontinuity” – typically without reference to any actual Enlightenment thinker. These clashes, calamities, and historical breaks, or steps forward and revolutions – he flings out willy-nilly anything he can seize on, the Paris Commune, Factory Acts, with Stalinism and the Shoah to boot – are part of the human tragedy. They are, he observes, “not necessarily without hope.” Melded with “fear and trembling, with a horror-stricken countenance.” (Page 62) Until death, we will never be certain than that there are more than “forces in the present which point beyond it.” (Page 69) This leaves the Marxist claim to have discovered something about the nature of social causation, the determination of the productive forces, which does point to a better existence, on the evidence of their growth over historical time, or “progress”, unresolved. The progressive rock on which the Second Internationaland mass popular Marxism were built may have been unsteady but Eagleton’s alternative is so inflected by tragedy – that it risks becoming pure theatre. To liven the tone between such grim observations, Eagleton shares his sense of levity with us. “Socialist media…would not ban everything but Schoenberg, Racine and endless dramatised versions of Marx’s Capital.”(Page 28) He tries his hand at irony, that capitalism “is as anti-hierarchical as the most pious postmodernist, as generously inclusivist as the most earnest Anglican vicar.”(Page 162) Not to mention straw-people, “Marx set his face resolutely against mock-heroic uprisings by grim-faced militants brandishing pitchforks against tanks.”(P 186) Adopting a homely tone, to prove the Americans are “unwitting Marxists” he cites this tale, “I was driving with the Dean of Arts of a state university in the American Midwest past thickly blooming cornfields (maize – AC). Casting a glance at this rich crop, he remarked, “The harvest should be good this year, Might just get a couple of assistant professorships out of that” (Page 156) How Eagleton must have inwardly smiled! Kant, the most striking author of the concept of self-determination, described the French revolution, as a sign that the human race will “henceforth progressively improve without any more total reversals. For a phenomenon of this kind which has taken place in human history can never be forgotten, since it has revealed in human nature an aptitude and power of improvement of a kind which no politician could have thought up by examining the course of events in the past.” (The Contest of Faculties. 1798). Having referred to Kant’s entirely speculative notion of radical evil – made it a central issue – in recent Eagleton’s writing, it would not perhaps be too much to see him discussed here. This might shed light on this alternative to the notion of ‘passive materialism’. We wait for a rigorous critique of the Subject, of Kant’s ‘noumenal’ realm of freedom. To discuss modern debates on Kantian norms, or politics, as picked apart by communitarian thinkers, such as Michael Sandel, or republican defenders of ‘agonistic democracy’, like Chantal Mouffe. But only tragic silence reigns. Eagleton eschews modern debates on the nature of the political. In this domain he merely repeats the received idea that, “Marx was an implacable opponent of the state” (Page 196). But, “For Marx there is still a state under socialism; only beyond socialism, under communism, will the coercive state give way to an administrative body.”(Page 208) Eagleton portrays this arrangement as a “decentralised network of self-governing communities, flexibly regulated by a democratically elected central administration.” It is, apparently, something quite different to Westminster. To him it’s an effective answer to anarchism. Thus a few well-chosen sentences have cleared up problems that have weighed on the minds of the left for more than a century and a half…..
And yet……. immediately after this all to brief reference to Marx and the state Eagleton launches into a discussion of Nietzsche and Freud. There is an “element” in power which “delights in flexing its muscles with no particular end in view, and which is always in excess of the practical goals to which it is harnessed.” We are lucky to escape without Foucault (referred to earlier as close to believing in the fundamental incoherence of history – Page 110), Guattari and Deleuze. So, thrown out by the democratic, autonomous, decentralised constitution of self-managed people, power’s – debilitating? – role returns in their midst. In other words, the problem of how to create stateless communism remains. And the character of politics and power is left hanging in the air. These are just illustrations of the difficulties Why Marx Was Right throws up. But perhaps there is a deeper, unifying, flaw. One would have expected a book that began with the claim that capitalism was “invisible” until Marx discovered it, would explore what this claim meant. That is, some introduction to the concepts of ‘fetishism’, of how this mode of production concealed its ‘secrets’ behind the ‘hieroglyphics’ of the exchange of commodities. One hopes that Eagleton does not imply that capitalism itself was ‘hidden’ – news to Marx who built his ‘critique of political economy’ on the explorations of capitalism by Adam Smith, Ricardo, Mathus, and other early economists – not to mention the famous government Blue Books. Marx’s originality was not to be able to “see” capitalism for the first time. Althusser put it that he did not operate with a “single logic of sighting and oversight” (Reading Capital 1968). Marx produced from classical political economy radically new concepts. These revealed the inner workings of capital – the production of value from labour power. Only, Althusser asserted, with an “informed gaze”, based on these novel concepts, can go beyond appearances. Yet, for Eagleton, a different method operates. Capitalism can, apparently, now become visible, as a symptomatic crisis does the ‘reading’ of its nature for us. This suggests that it is a curious kind of diaphanous creature, now you see it, now you don’t. Sometimes you see right through it. Not theory, but time and place determine these possibilities. But is this not compatible with Marxism? Not only believers in Marx but in Jesus can approach Communism. They may mingle. In the present work, Eagleton recoils at the ‘Enlightenment’ picture of “dead meaningless matter” because of their denial of human active consciousness, not their atheism. (Page 133). By contrast, he offers, in the middle of tragedy, a Marx, a materialist with a soul, “one doesn’t need to be religious to be spiritual.”(Page 157) Marx, inspired by the Jewish feeling for “history as a narrative of liberation” (Ibid) stretched out to the Aristotelian ‘virtue ethics’. Joining in this are, “Jewish Marxists, Islamic Marxists, and Christian Marxists who champion so-called liberation theology. All of them are materialists in Marx’s sense of the word.” (Page 157) Whether ‘mechanical’ atheists are materialists is far less certain. Marx was, in short, was on the road to higher things, a helpmate and a guide to help us cross the slough of despond in search of better things, “The spiritual is indeed about the otherworldly. But it is not the otherworldly as the persons conceive it. It is the other world which socialists hope to build in the future, I place of one which is clearly past its sell-by date. Anyone who isn’t otherworldly in this ensue has obviously not akin a good hard look a round them.”(Page 159) Perhaps we too may see invisible entities and might confront, as James put it, the Riddles of the Sphinx. Much of Why Marx is Right does what it says: it defends Marx from the critics who have “travestied” him. The portrait of a generous, activist, humanist democratic socialism is appealing, and Eagleton is deft at tackling the differing claims of class and oppressions, gender and race. He is a democrat, if a little unclear about what this means in practice. Perhaps someone more generously disposed would find other good arguments amongst its dialectic. 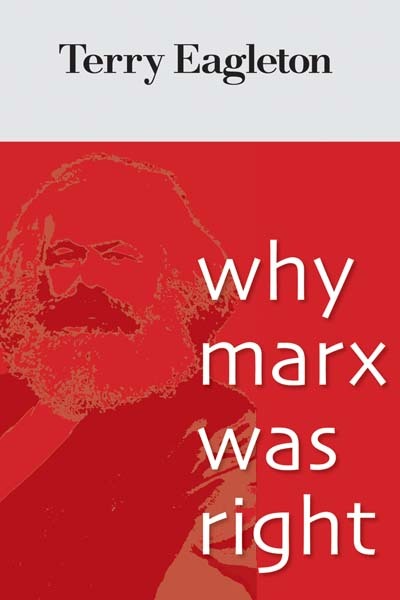 As a blanket claim, the book cannot, nevertheless, be said to indicate ‘why’ Marx was ‘right’. It is uncertain about “why” Marx produced an critique of capitalism, relying on an account of the basic categories of Capital that contains assertions about Marx – from his method to his politics – that leave us waiting for further explanation. It uncovers more difficulties than it solves, and only rarely comes up with simple enough statements that could be said to be right or wrong. At least one of Eagleton’s textual effects is to share in some reflected glory, or, more kindly put, to adopt Marx for his cause. I have suggested that this leads to a travesty of Enlightenment thinking, a large area of non-thought in his writing. Does this demonstrate La Rochefoucauld’s point that casts doubt on the motives of those who praise others? At least some of the admiration Eagleton displays for Marx is designed to muster support for his revivalist campaign against the decidedly anti-spiritual atheists. This does not strengthen his arguments – far from it. Though perhaps there are those who will clarify what exactly ‘spiritual materialism’ is, before we pass over to the other-world. In the meantime there is always barbarism to worry about. * William James. The Will to Believe. 1915. Morgan Alexander Brown tackles the economists’ criticisms of Marxism that Eagleton misses. here. Tristram Hunt pokes gentle fun at Eagleton – here. Matt Richards loves the book – here. Jack Farmer of the SWP thinks this book will “arm” people with Marxism – here. Andrew Murray hails Eagleton’s religious campaigning but finds fault in this work – here. « Flying Saucers and Socialism: J.Posadas.